I wrote a blog recently about the move by some online developers into bizarre children's territory with some of their games - a world of bright colors, cutesy characters and a general feel that wouldn't be out of place on the Nickelodeon channel. Developer Leander's cartoony Glutters slot - a game filled with amorphous multicolored blobs shooting custard pies into each other's mouths (you have to try it to understand it) - was a case in point, and it's really interesting to know just who the hell plays these games, 'cos it certainly ain't kids. Well, for the sake of our society and humanity, we must certainly hope it ain't the kids! 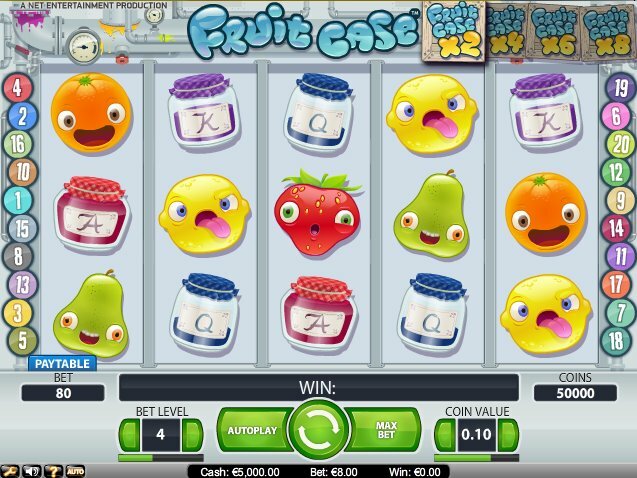 Online slot developer NetEnt's Fruit Case slot follows a similar theme, which at first glance seems classic enough - all strawberries, melons and lemons - until our friendly Manga fruit get smushed in an electric blender. If the cute feel of the game doesn't quite appeal, the special features in this 5 reel, 20 pay-line slot may. Bets start at just $0.01 a coin, but there's a max. bet of $100 a spin, so fans of cute slots with big wallets are also catered for. Fans of interesting add-ons are also catered for, as the game carries Avalanche Reels - a popular NetEnt feature - and a neat 'Free Falls' bonus if you hit three or more Scatters on the reels. 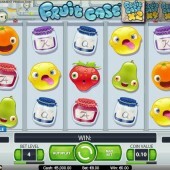 Avalanche Reels is like innovative developer WMS Gaming's Cascading Reels feature. After a winning combo has hit the reels, the winning pay-line vanishes from view and is replaced by the symbols immediately above. This leads to more potential wins, but there's an added bonus: at the top of the screen is a list of multipliers (from 2x to 8x) which are applied to every winning spin after Avalanche Reels have hit. The multiplier then increases for every extra Avalanche win you manage to hit. Look out too for the Fruit Case logo Wild. Not only does it apply for all symbols in the game but the multiplier increases for all winning combos along the same lines as the Avalanche multiplier. The Free Falls bonus is activated by three Free Fall Blender symbols appearing on the reels left-to-right. On hitting this you'll get 10 free spins with a 3x multiplier attached. They can also be re-triggered, and with the Avalanche Reels feature applied, it can certainly turn into a really lucrative bonus round. That's if you hit it in the first place, of course. I found the Free Falls feature hard to come by, as it's not activated by Scatters, but persevere long enough and it can really pay for you.